This document derives the Fourier Series coefficients for several functions. The functions shown here are fairly simple, but the concepts extend to more complex functions. This can be a bit hard to understand at first, but consider the sine function. 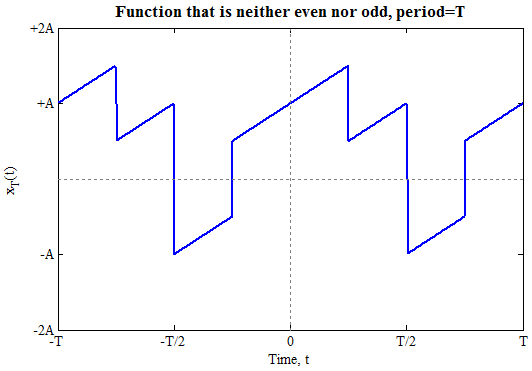 The function sin(x/2) twice as slow as sin(x) (i.e., each oscillation is twice as wide). In the same way ΠT(t/2) is twice as wide (i.e., slow) as ΠT(t). Since the function is even there are only an terms. Any interval of one period is allowed but the interval from -T/2 to T/2 is straightforward in this case. This result is further explored in two examples. The values for an are given in the table below. Note: this example was used on the page introducing the Fourier Series. Note also, that in this case an (except for n=0) is zero for even n, and decreases as 1/n as n increases. As you add sine waves of increasingly higher frequency, the approximation improves. The addition of higher frequencies better approximates the rapid changes, or details, (i.e., the discontinuity) of the original function (in this case, the square wave). Gibb's overshoot exists on either side of the discontinuity. 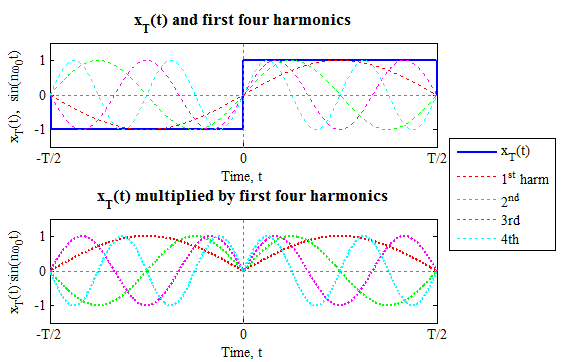 The rightmost button shows the sum of all harmonics up to the 21st harmonic, but not all of the individual sinusoids are explicitly shown on the plot. In particular harmonics between 7 and 21 are not shown. The values for an are given in the table below (note: this example was used on the previous page). Note that because this example is similar to the previous one, the coefficients are similar, but they are no longer equal to zero for n even. which generates the same answer as before. This will often be simpler to evaluate than the original integral because one of the limits of integration is zero. As before the integral is from -T/2 to +T/2 and make use of the facts that the function is constant for |t|<Tp/2 and zero elsewhere, and the T·ω0=2*·π. Euler's identities dictate that e+jθ-e-jθ=2jsin(θ) so e-jθ-e+jθ=-2jsin(θ). Note that, as expected, c0=a0 and cn=an/2, (n≠0) (since this is an even function bn=0). If xT(t) is a triangle wave with A=1, the values for an are given in the table below (note: this example was used on the previous page). Note: this is similar, but not identical, to the triangle wave seen earlier. As you add sine waves of increasingly higher frequency, the approximation gets better and better, and these higher frequencies better approximate the details, (i.e., the change in slope) in the original function. The amplitudes of the harmonics for this example drop off much more rapidly (in this case they go as 1/n2 (which is faster than the 1/n decay seen in the pulse function Fourier Series (above)). Conceptually, this occurs because the triangle wave looks much more like the 1st harmonic, so the contributions of the higher harmonics are less. Even with only the 1st few harmonics we have a very good approximation to the original function. There is no discontinuity, so no Gibb's overshoot. As before, only odd harmonics (1, 3, 5, ...) are needed to approximate the function; this is because of the symmetry of the function. Thus far, the functions considered have all been even. The diagram below shows an odd function. It is easiest to integrate from -T/2 to +T/2. Over this interval $x_T(t)=2At/T$. Note: this is similar, but not identical, to the sawtooth wave seen earlier. There is Gibb's overshoot caused by the discontinuity. For this reason, among others, the Exponential Fourier Series is often easier to work with, though it lacks the straightforward visualization afforded by the Trigonometric Fourier Series. There is Gibb's overshoot caused by the discontinuities. If the function xT(t) has certain symmetries, we can simplify the calculation of the coefficients. 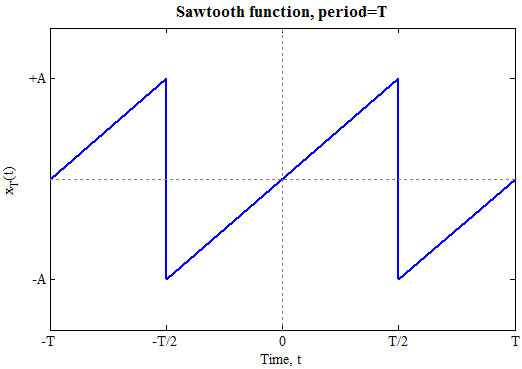 The first two symmetries are were discussed previously in the discussions of the pulse function (xT(t) is even) and the sawtooth wave (xT(t) is odd). 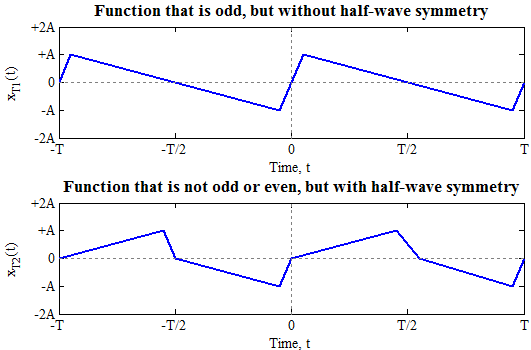 Half-wave symmetry is depicted the diagram below. The reason the coefficients of the even harmonics are zero can be understood in the context of the diagram below. The top graph shows a function, xT(t) with half-wave symmetry along with the first four harmonics of the Fourier Series (only sines are needed because xT(t) is odd). The bottom graph shows the harmonics multiplied by xT(t). Now imagine integrating the product terms from -T/2 to +T/2. The odd terms (from the 1st (red) and 3rd (magenta) harmonics) will have a positive result (because they are above zero more than they are below zero). The even terms (green and cyan) will integrate to zero (because they are equally above and below zero). Though this is a simple example, the concept applies for more complicated functions, and for higher harmonics. The only function discussed with half-wave symmetry was the triangle wave and indeed the coefficients with even indices are equal to zero (as are all of the bn terms because of the even symmetry). The square wave with 50% duty cycle would have half wave symmetry if it were centered around zero (i.e., centered on the horizontal axis). In that case the a0 term would be zero and we have already shown that all the terms with even indices are zero, as expected. Simplifications can also be made based on quarter-wave symmetry, but these are not discussed here. (assuming xT(t) is real) we can use the symmetry properties of the Trigonometric Series to find an and bn and hence cn. The magnitude of the cn terms are even with respect to n: |c-n|=|cn|. The angle of the cn terms are odd with respect to n: ∠c-n=-∠cn. If xT(t) is even, then bn=0 and cn is even and real. If xT(t) is odd, then an=0 and cn is odd and imaginary. 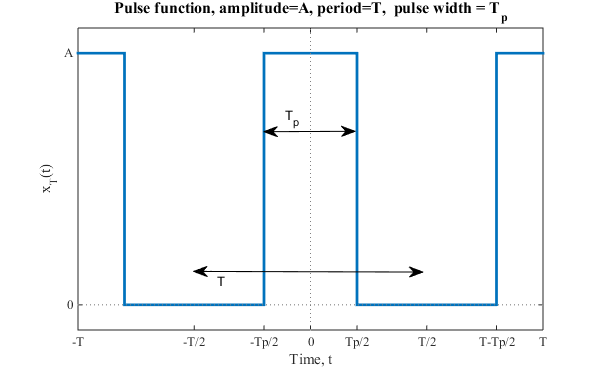 Let's examine the Fourier Series representation of the periodic rectangular pulse function, ΠT(t/Tp), more carefully. We can change the limits of integration to -Tp/2 and +Tp/2 (since the function is zero elsewhere) and proceed (the function is one in that interval, so we can drop it). We also make use of the fact the ω0=2π/T and Euler's identity for sine. The last step in the derivation is performed so we can use the sinc() function (pronounced like "sink"). This function comes up often in Fourier Analysis. sinc(x)=0 for all integer values of x except at x=0 where sinc(0)=1. This is because sin(π·n)=0 for all integer values of n. However at n=0 we have sin(π·n)/(π·n) which is zero divided by zero, but by L'Hôpital's rule get a value of 1. The first zeros away from the origin occur when x=±1. The function decays with an envelope of 1/(π·x) as x moves from the origin. This is because the sin() function has successive maxima with an amplitude of 1, and the sin function is divided by π·x. The diagram below shows cn vs n for several values of the duty cycle, Tp/T. The graph on the left shows the time domain function. If you hit the middle button, you will see a square wave with a duty cycle of 0.5 (i.e., it is high 50% of the time). 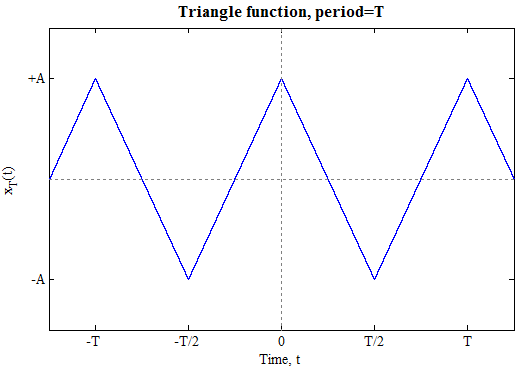 The period of the square wave is T=2·π;. The graph on the right shown the values of cn vs n as red circles vs n (the lower of the two horizontal axes; ignore the top axis for now). The blue line goes through the horizontal axis whenever the argument of the sinc() function, n·Tp/T is an integer (except when n=0.). In particular the first crossing of the horizontal axis is given by n·Tp/T=1 or n=T/Tp (note this is not an integer values of Tp). There are several important features to note as Tp is varied. As Tp decreases (along with the duty cycle, Tp/T), so does the value of c0. This is to be expected because c0 is just the average value of the function and this will decrease as the pulse width does. As Tp decreases, the "width" of the sinc() function broadens. This tells us that as the function becomes more localized in time (i.e., narrower) it becomes less localized in frequency (broader). In other words, if a function happens very rapidly in time, the signal must contain high frequency coefficients to enable the rapid change. This tells us explicitly that the product of width in frequency (i.e., Δn) multiplied by the width in time (Δt) is constant - if one is doubled, the other is halved. Or - as one gets more localized in time, it is less localized in frequency. We will discuss this more later.